Today’s post is in honor of 1st Lt. Nainoa K. Hoe, who was killed by an enemy sniper on this date in 2005 in Mosul, Iraq. The 27-year-old from Kailua, Hawaii was assigned to the 3rd Battalion, 21st Infantry Regiment, 1st Brigade, 25th Infantry Division. 1944: Allied forces, including the U.S. VI Corps under the command of Maj. Gen. John P. Lucas (of Lt. Gen. Mark Clark’s Fifth Army), begin a series of landings along a stretch of western Italian coastline in the Anzio-Nettuno area. The Allies achieve complete surprise against – and encounter little initial resistance from – the Germans, but the landings, codenamed Operation SHINGLE, kick off what will become one of the most grueling campaigns of World War II. To distract from the Anzio landings, Gen. Clark’s forces attack key positions along the Rapido River. Company F of the 143rd Infantry Regiment is handed the responsibility of charging across the bridge targeted by artillery and mortars and into a killzone of withering machinegun fire. Staff Sgt. Thomas E. McCall and several of his men make it across the ice-covered bridge, and he quickly reassembles what remains his soldiers. They maneuver across open, muddy terrain and barbed wire to a spot where McCall orders his two squads to set up their machine guns. But enemy artillery quickly wipes out all of McCall’s men and one of the guns. 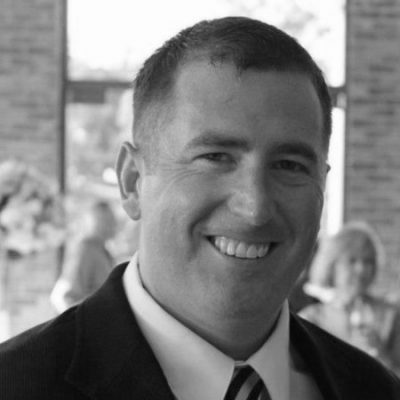 McCall drags the wounded to cover and provides first aid, then grabs the last surviving machinegun and runs toward the enemy machinegun positions. He charges into one, killing its occupants, then wipes out another. McCall is last seen charging into a third enemy machinegun position, and will be captured by the Germans. McCall is awarded the Medal of Honor, and will fight again in Korea. 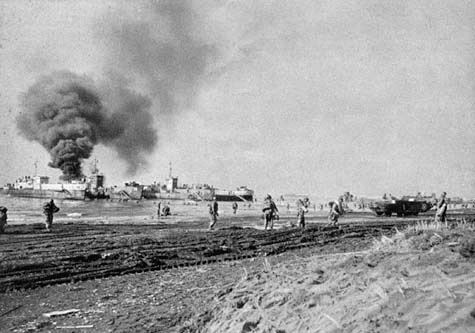 The Battle of Rapido river was considered one of the worst defeats for the U.S. Army during World War II and was the subject of a Congressional investigation following the war. 1946: Four months after dismantling the Office of Strategic Services, President Harry S. Truman creates the Central Intelligence Group, the predecessor to today’s Central Intelligence Agency. 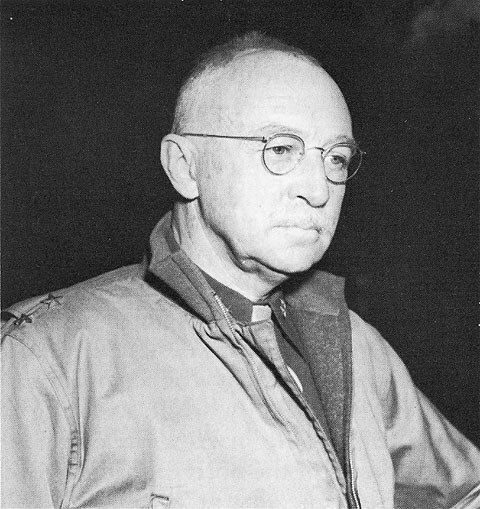 Truman picks Rear Adm. Sidney Souers as the first Directer of Central Intelligence, presenting Souers with a black cloak, black hat, and a wooden dagger as he informs the new DCI of his duties. 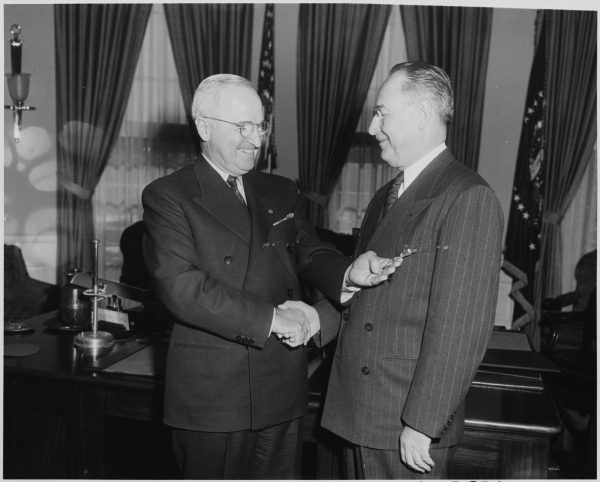 Photograph of President Truman in the Oval Office presenting the Distinguished Service Medal to Rear Admiral Sidney Souers. 1968: (Featured Image) With aerial photographs, ground reconnaissance reports, and a massive array of electronic sensors indicating that some 20,000 North Vietnamese Army soldiers now surround Khe Sanh Combat Base, the U.S. military launches their massive Operation NIAGARA II air campaign to attack the enemy and supply the cut-off American troops. 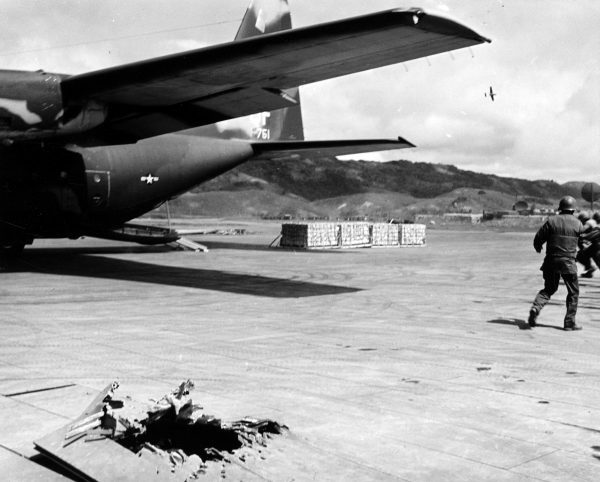 Dubbed “the most concentrated application of aerial firepower in the history of warfare,” NIAGARA’s B-52s and tactical bombers will rain down nearly 100,000 tons of bombs — with artillery firing eight times that amount in shells — on the enemy, hoping to prevent a repeat of the French disaster at Dien Bien Phu in 1954. Meanwhile, transport planes ferry supplies to the besieged Marines in the largest aerial supply operation since the Berlin Airlift. 1969: Operation DEWEY CANYON, the Marine Corps’ last major offensive of the Vietnam War, begins. 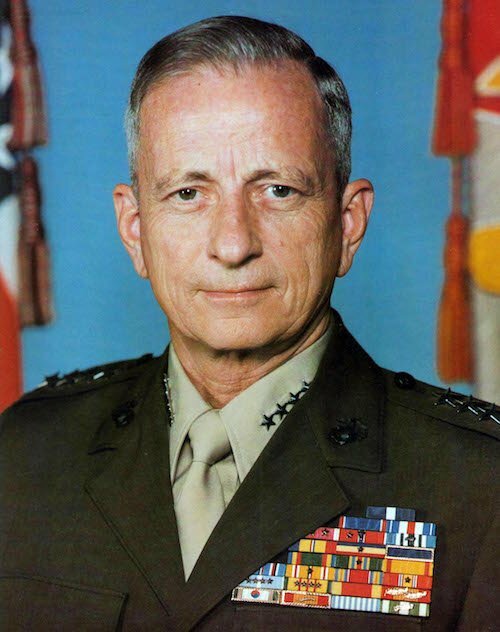 Marines under the command of Col. Robert H. Barrow will spend 56 days clearing out the North Vietnamese Army’s stronghold near the A Shau Valley. General Robert H. Barrow, named the “finest company commander” of the Korean War, served with the Marines in China during World War II, earned the Navy Cross during the Battle of the Chosin Reservoir, and the Army’s Distinguished Service Cross for his valor during Operation DEWEY CANYON. 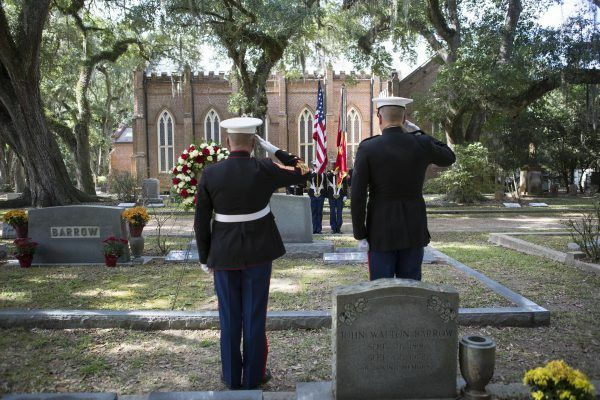 Annual wreath laying ceremony for Gen. Robert H. Barrow, the 27th Commandant of the Marine Corps. Since Barrow’s death in 2008, Marines lay a wreath on his grave every Nov. 10 to honor him and his service. 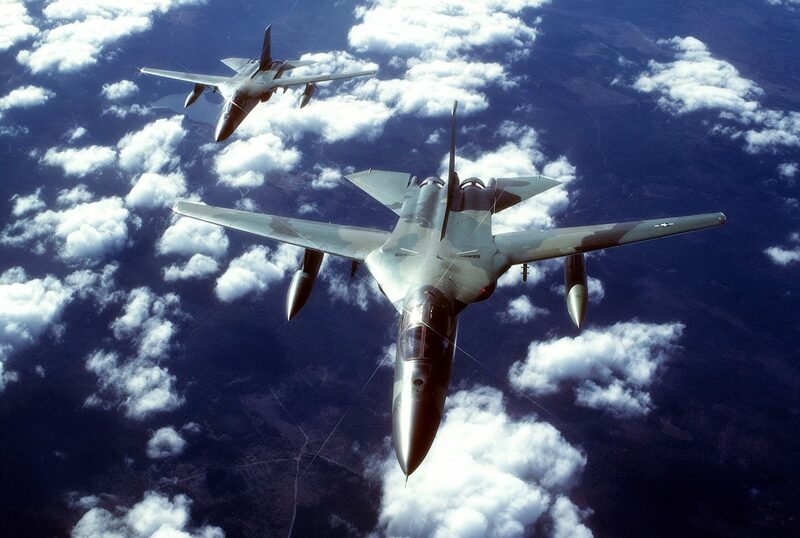 1991: Smart bomb attacks by F-111 Aardvark fighter-bombers prove so devastating to warplanes parked at Iraq’s air fields that what remains of the Iraqi Air Force flies to neighboring Iran. Coalition planners expected Saddam Hussein would try to salvage his planes by flying them to Jordan — not their longtime enemy Iran. However, it would be decades before Iraq gets any of their planes back.